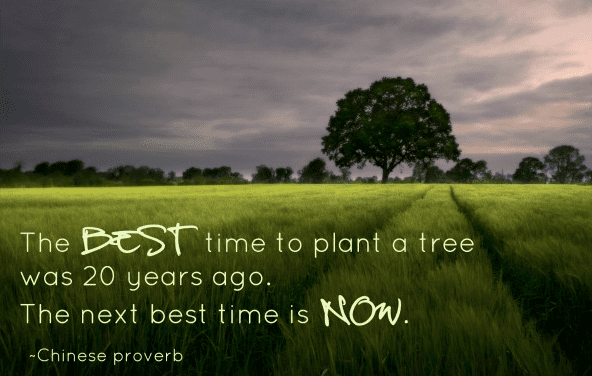 What’s true for trees is also true for starting one on ones. 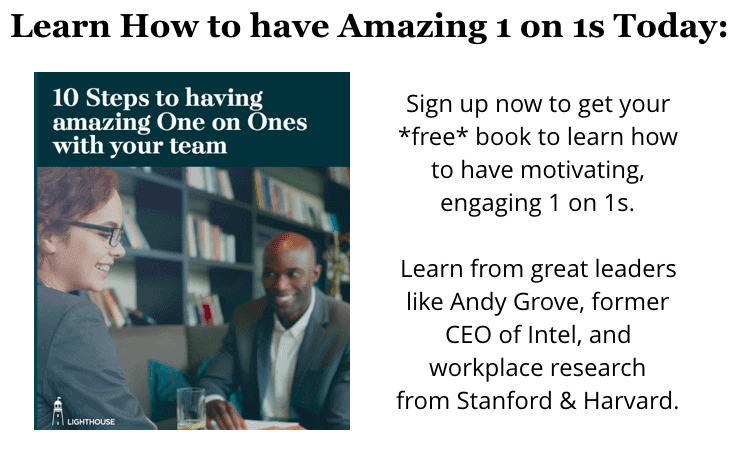 If you aren’t having one on ones with your team, you’re missing out on an incredible motivating, problem solving, pressure relieving opportunity to help and grow your team. But even if you’re totally bought into starting them, it can be intimidating to actually get started. I want you all to start off on the right foot, so this post is here to help you with all those questions and more. Follow these tips and you’ll start your one on ones like a seasoned pro. A one on one is unlike any other meeting you have. This meeting is all about the team member; their needs, frustrations, feedback, ideas, and career growth are the topics of discussion. They should not be about status updates on projects and tasks. There are plenty of other places to talk about those things. The first couple of one on ones with a team member will be a bit awkward. This is normal. Push through it, and you’ll find you both will start looking forward to them. Think about how uncomfortable a first date, when you’re new to a group, or tried doing just about anything for the first time. Come in knowing you and your team member may both feel this way. The best way to beat awkward is to bring a few easy questions to warm things up. These can be rapport questions to get to know them better personally (family, hobbies, hometown, etc) or they can be any of a variety of great one on one questions to get their feedback and ideas. I’m going to start doing one on ones with you and other members of the team. This is to get more feedback from you as well as give you a place we can talk about anything that’s bothering you, your career development, and more. To start, we’ll have the first one on Tuesday, January 20th at 2pm. We can then talk about a time that we can stick to regularly afterwards. If you set their expectations from the beginning that the meeting is all about them, and give them some forewarning, you can be sure to start on the right foot. A crucial part of one on ones working well is that you have a reliable schedule for them occurring. When you and your team member can count on the meeting happening, you can both bring things to the meeting to discuss and not let anything slip that should be talked about. Schedule weekly or bi-weekly, for 60 minutes. The best cadence for these discussions is every week (for small teams, 5 or less people), and every other week (for larger teams, or people you known very well). This frequency gives you enough time to make progress on what you discuss, while also not going too long between check ins. Book these meetings recurring on your calendar so you both have it and don’t accidentally schedule over them. Make sure it’s a time you can stick to; there’s nothing worse than constant rescheduling, or worst of all, canceling your one on ones. Consider what’s a good workflow for you and your team. Some people like having a “people day” where they’ll have a bunch of their one on ones and take care of anything that comes up in the meetings all at once. Others prefer a set time each day, where they’ll have 1-2 of them each morning. Either way, building a routine you can stick to is crucial to the health of the one on one and the relationship with your team member. You can always end a few minutes early of the hour, but that’s very different than coming late to a 30 minute meeting that now is just a quick 15 minute where you can’t really dive into anything as you rush to the next meeting on your calendar. Given the huge ROI these meetings have for morale and coaching your team, you don’t want to shortchange them. One on ones should be less formal meetings than many of your others. Consider taking a walk, going for coffee or lunch, or going to a more casual, but private, part of your office for the discussion. This will help you both relax. Especially for your first few meetings, it can be really helpful to bring a few questions to ask. Over time, your team member is likely to bring things to discuss as well, but you can’t rely on that alone. There are many things that they may not think to share and you should work to dig out. This list of one on one questions can help. By writing it down, you show what they’ve said matters, and you help yourself remember it, so you build trust with them that when they share something with you, it’s not forgotten and action is taken. This is the foundation of a healthy one on one relationship with your team member. Want a hand in making the most of your 1 on 1s you’re starting? Then sign up for a free trial of Lighthouse here, and get help with prep before, helpful questions to ask during, and easy followup afterwards. One on ones will usually end on a high note. Even if you cover some difficult topics, the goal of the meeting is to help resolve them, and make things better for your team member. The best way to do that is to end each meeting by coming up with action items for both of you to be accountable to. An app like Lighthouse can help you keep track of your one on one notes and automatically send out action items to you and your team. 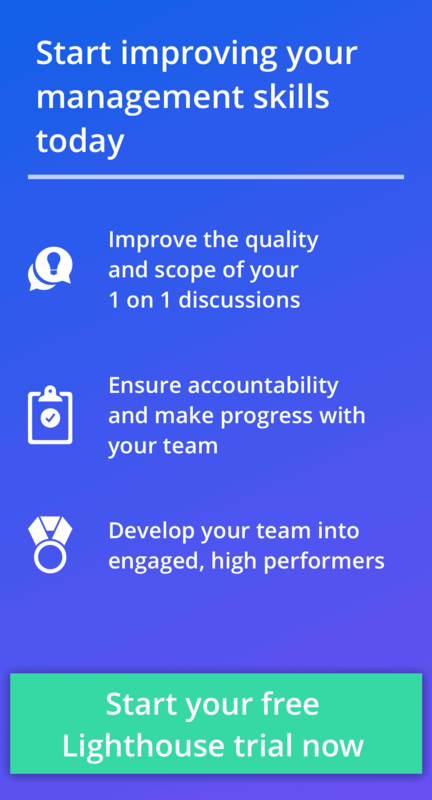 By setting some actionable things you can both do based on your discussion, you’re helping your team experience the progress principle; by making small, incremental progress, your team will be more motivated and engaged at work. You’ll also build their confidence and trust in you that when they come to you with a problem you will not only listen, but help them do something about it. What you talk about in one on ones can vary from meeting to meeting, but it’s important to build momentum for each person on your team. This comes from closing the loop from your last one on one with them. The first step to close the loop is to review your notes from last time; if you don’t remember what you talked about, they’ll resent it and feel you don’t really value the meeting. You can also accidentally stick your foot in your mouth by giving conflicting advice to what you said before. To really close the loop though, you want to also circle back to those action items from last one on one with them; this ensures that progress really happens by holding you both accountable. It also builds confidence, as you both feel the progress being made on issues that matter to them. You can then either spend more time on the issue in the next one on one, or confidently move on to the next issue knowing action will be taken on anything they bring up. There’s always more to cover in one on ones. By bringing a little preparation, following through on what you discuss, and mixing up what you talk about, you can turn these into invaluable meetings for you and your team.